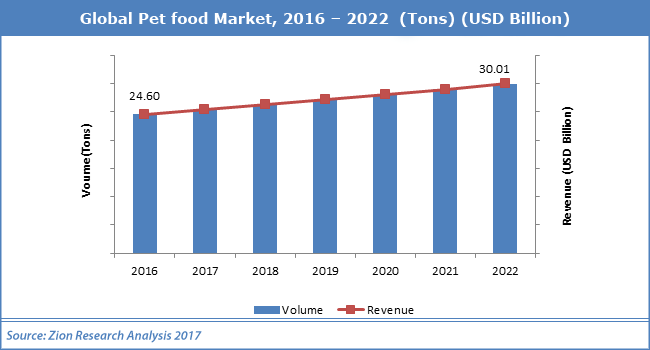 U.S. pet food market is expected to reach USD 30.01 billion in 2022 and is anticipated to grow at a CAGR of 3.36% between 2017 and 2022. Pet food is ready to serve food for pets such as dogs, cats, fish, birds and others. Pet food has gained huge demand in recent times owing to various products present in the market. Pet food consists of several ingredients which provide ample amount of nutrition to the pets. The increasing trend for ready to serve pet food is likely to drive the pet food market in coming years. Moreover, the sharp rise in discretional income along with changing lifestyle is expected to aid the pet food market growth. Growing fad towards a choice of different pets in U.S is likely to intensify the market growth in the forecast period. Pets are considered as strained solace which is gaining huge eminence among the U.S population, especially in teenagers. This factor is predicted to positively influence the pet number in U.S which in turn is likely to bloom the pet food market in the coming years. However, stringent regulations implemented by the government on the nutritional level of pet food may impede the growth of the pet food market. Nevertheless, ongoing intense research & development for introducing innovate and nutritional food products are likely to optimize the further growth of the market in upcoming years. On the basis of product, the pet food market can be segmented as wet food, dry food, nutrition food, snacks and others. Dry food curled the majority of the pet food market share in 2015 and is liable to maintain its pace in the coming years. Dry food possesses long shelf life and eases in handling and storing, this factor is likely to propel the growth of dry pet food market in the forecast period. However, it is expected that nutrition food will encounter huge growth in near future owing to increasing prevalence of obesity among cats and dogs. The end users for the pet food market are cats, dogs, and others. The other segment includes fish and birds among others. Among all, dogs segment governed the pet food market in 2015 with noteworthy market share. This is mainly due to the existence of bazillion of dogs across the houses of U.S. Cat segment is expected to grow at the fastest pet due to fondness towards cats. U.S gripped the majority of the pet food market across the globe in 2015 and is further expected to fortify the pet food market in near future. As per the National Pet Owners Survey in 2015 around 60% of U.S houses hold pets. This factor is likely to positively impact on the pet food market in this region. The shift in preference for nutritious pet food over the conventional food is expected to foster the demand for pet food market in U.S. There almost 300 manufacturers operating in pet food sector in U.S which in total produce approximately 7 million tons of pet food annually. Reluctance for daily cooking among U.S populace is anticipated to contribute to the high growth of pet food market in near future. Some of the global major players in the pet food are Mars Petcare Inc., Big Heart Pet Brands, P&G PetCare, Nestle Purina PetCare, Hill’s Pet Nutrition, Diamond Pet Foods, Deuerer, Blue Buffalo, WellPet and Heristo AG. The presence of various vendors in the U.S market forces the players to focus on the product development to sustain in the pet food market.